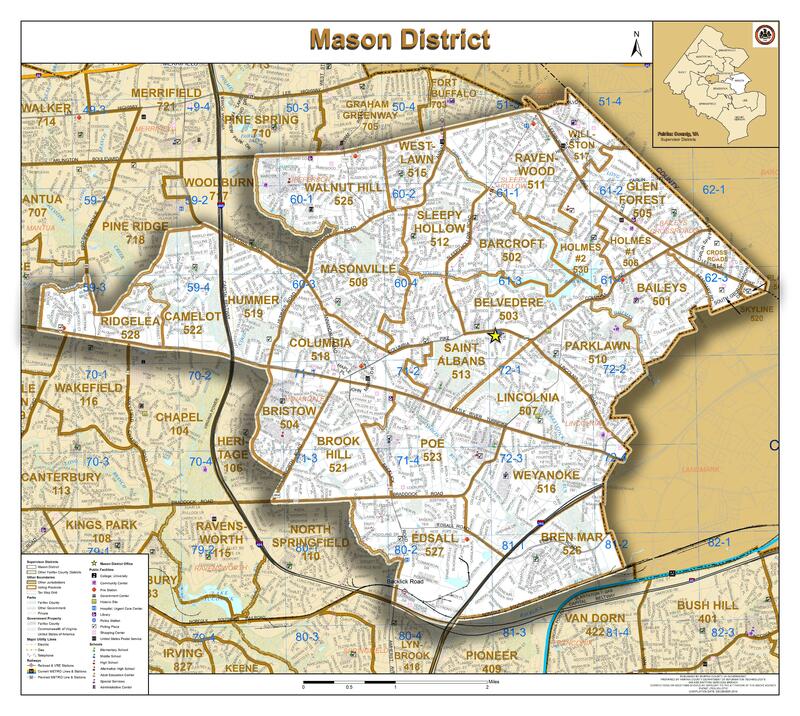 Mason District is one of the nine “magisterial districts” within Fairfax County, and all members of the Mason District Democratic Committee are members of the Fairfax County Democratic Committee (FCDC). The Mason District Democratic Committee helps to register voters, informs voters about Democratic candidates, and works to get out the vote. The party committees provide volunteers and infrastructure to support campaigns within the district. Virginia has elections every year, so there’s always work to be done. Mason District is bordered to the east by Arlington County and Alexandria City. Its southern border is comprised of the Capitol Beltway, Braddock Road and sections of Little River Turnpike encompassing Lincolnia, small parts of Springfield and a majority of Annandale both inside and outside the beltway. The districts northern border runs along Woodburn Road, Gallows Road and Arlington Blvd (Route 50) upto 7 Corners. If you are in Fairfax County, and your precinct number starts with a 5, you’re in Mason District. If you’re still unsure whether you’re part of the Mason District, you can look up your voter info here. The Mason District Democratic Committee values inclusion. We invite all Democrats, regardless of race, color, creed, national origin, sexual orientation or disability to join us. All of our meetings are open, and we look forward to meeting you. You don’t have to be a member to attend or participate. The FCDC has several Standing Committees which have representatives from each Magisterial District Committee and these Standing Committees meet regularly. Democratic Party Platform is adopted every four years at the Democratic Party Convention. The most recent one was adopted in 2016. Democratic National Committee Under the leadership of Chair Tom Perez, the DNC is composed of the chairs and vice-chairs of each state Democratic Party Committee and over 200 members elected by Democrats in all 50 states and the territories. Each Congressional District committee consists of 20 members who are elected every four years (in the spring of the year when there is a Gubernatorial election). These members are on the State Central Committee, and also decide how the Democratic candidates for Congress in that district will be chosen.